Engineer (Civil), Assistant Engineer, Sub Engineer, Chief Planner, Assistant Planner, Accountant, Administrative Officer, Officer Manager, Office Assistant, Chartered Accountant and Computer Programmer posts. Total available vacancies in this GSCDCL recruitment are 31 posts. Job seekers willing to apply for the current recruitment have to visit the GSCDCL notification for qualification, age limit and other eligibility criteria. Candidates fulfill the mentioned qualifications may send the hard copy of application to the Chief Executive Officer, Gwalior Municipal Corporation Office, Narayan Krishna Shejwalker Bhavan City Center, Lashkar Gwalior, Madhya Pradesh- 474011 by 30th November-2017. Full information regarding selection process, Age limits, Educational Qualifications, Application Procedure of Gwalior Smart City Development Corporation Limited GSCDCL recruitment of 31 Assistant Engineer, Sub Engineer, Office Assistant vacancies notification are mentioned below. Last date for receiving application form (offline): 30-November-2017. Available vacancies in Gwalior Smart City Development Corporation Limited GSCDCL Recruitment are 31 posts. 1. Chief Engineer: 01 post. 2. Superintendent Engineer: 01 post. 3. Executive Engineer (Civil): 01 post. 4. Assistant Engineer: 04 posts (Civil: 02, Electrical: 01, Mechanical: 01). 5. Sub Engineer: 08 posts (Civil: 02, Electrical: 01, Mechanical: 01). 6. Chief Planner: 01 post. 9. Administrative Officer: 01 post. 10. Officer Manager: 02 posts. 11. Office Assistant: 05 posts. 12. Chartered Accountant: 01 post. 13. Computer Programmer: 02 Posts. 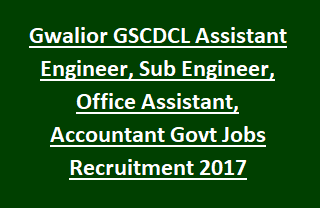 Qualification details for GSCDCL Recruitment vacancies please go through the official notification. Go through the GSCDCL notification for Age limit and relaxation details. Please check GSCDCL Recruitment notification for Pay scale details. Selection for this GSCDCL Recruitment vacancies is based on candidate merit in written exam/ interview. For detailed selection process go through GSCDCL notification. Interested individuals may go through the GSCDCL official website http://gwaliorsmartcity.org/. Open the recruitment page and apply for desired post. Send the application copy to the following address before 30th November-2017. Candidates must also send their Resume/ Bio-data to the e-mail address: gwaliorsmartcity@gmail.com.